Wow, what a beautiful project! 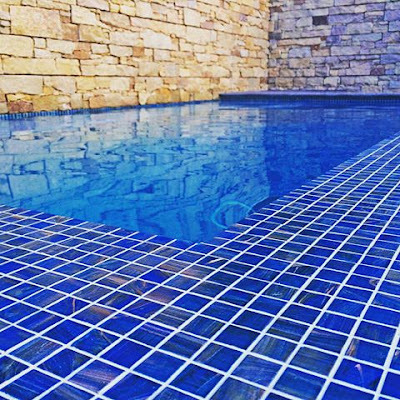 This luxury pool was installed by Adept Pools in NSW, using the LATICRETE Pool, Spa and Fountain Tiling System. This project will continue to look amazing for many years to come. Are you planing a pool project in the near future? LATICRETE has the perfect Pool, Spa and Fountain Tiling Systems brochure for you - which includes a LATICRETE System Warranty. Click here to view/download the LATICRETE Pool, Spa and Fountain Tiling System Brochure. Projects utilising LATICRETE materials and methods qualify for a comprehensive LATICRETE System Warranty. Visit our website for comprehensive product application videos, architectural specifications, details and in-depth technical support. Click here to view our Holiday Schedule. 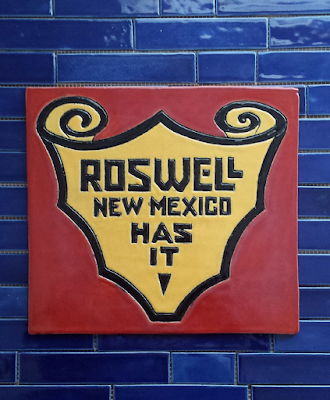 Estabilished in 1982, Reischman Park in Roswell New Mexico was gifted to the city by the Reischman family. Over the years the 51m2 park has suffered wear and tear. 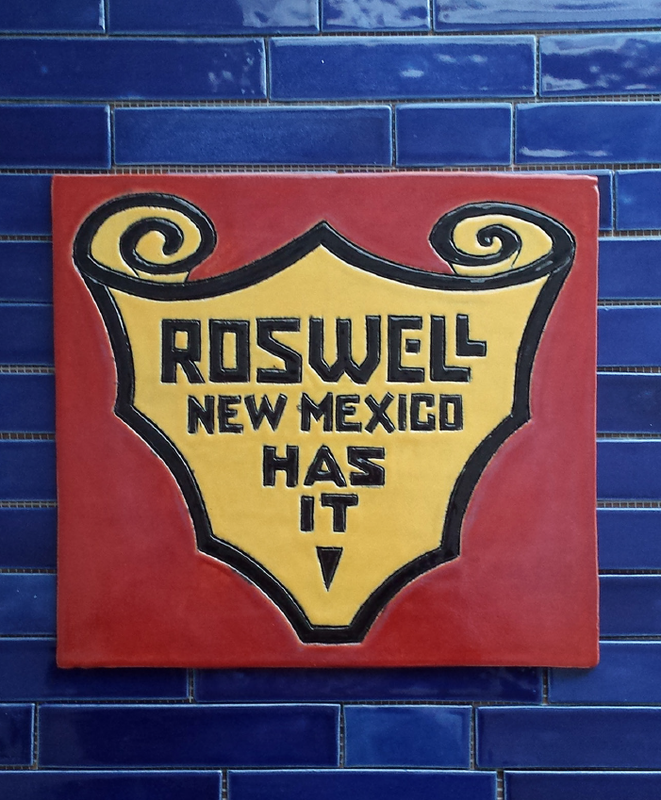 In 2013 renovations were coordinated with the non-profit Roswell Interarts Organization (RIO), which raised separate funds to create the custom artwork for the park. "We recognize LATICRETE as a strong company with a fine reputation for great products and exceptional service” Harva commented. The Reischman Park project has taken over six years to complete and all parties involved are extremely happy with the outcome of the new Reischman Park. Read the full Project Spotlight here. Head In To Walker Tiles! 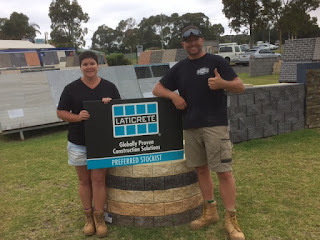 Walker Tiles in Goulburn, NSW, is your local stockist for all your LATICRETE installation Materials - so head in to visit the team at Walker Tiles today. For more information on using LATICRETE in your projects, arrange product demos, samples or technical support please contact LATICRETE on 1800 331 012, email sales@laticrete.com.au or visit www.laticrete.com.au. LATICRETE Australia wishes you a very Merry Christmas for Sunday! 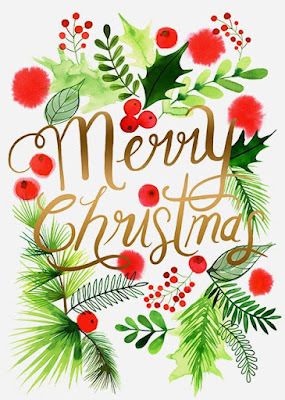 May your day be filled with peace, happiness, fun, food, family and friends. 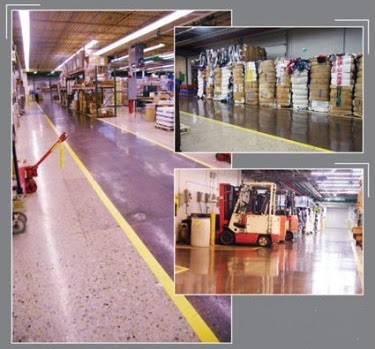 Goodwill Industries Facilities Director, Doug Nass, was looking to restore the epoxy coated floors in the Goodwill Industries building, in Wisconsin. With four decades of abuse and multiple layers of damaged epoxy coatings, Doug knew it wasn't going to be an easy job. After hearing about LATICRETE® L&M™ Construction Chemicals, FGS PermaShine flooring system through a friend, Doug contacted L&A Crystal, a FGS PERMASHINE installer, and soon they were on the job installing the flooring system in the retail services area of the facility. After that area was completed, Nass and Vicki Holshuh, Goodwill's Vice Presidents of Retail Services, decided to extend the FGS floor system into the Work Services Area of the building. 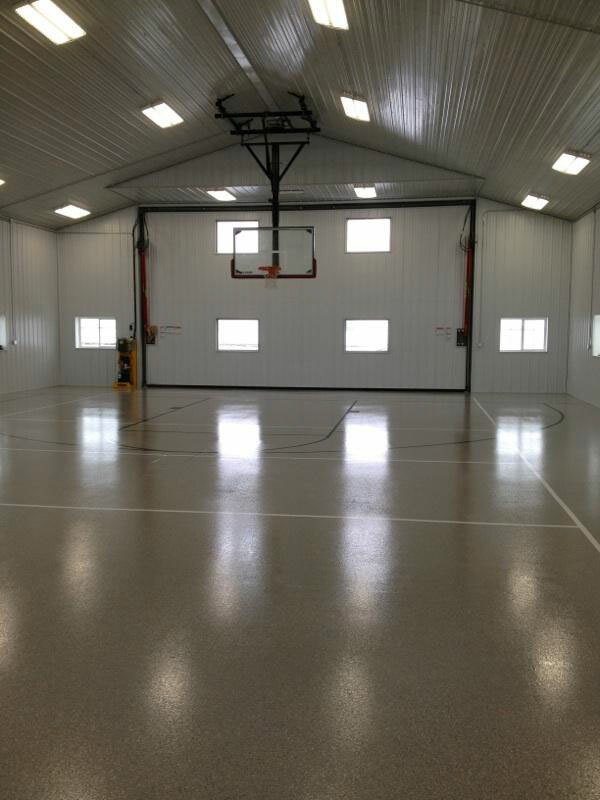 Nass commented, "I'm happy with the overall look and serviceability of our new floor. 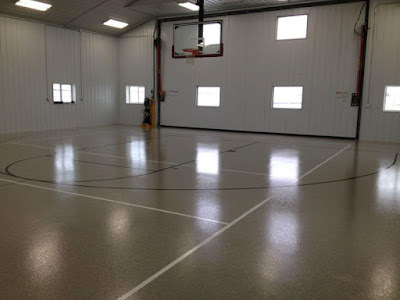 We would recommend this floor system to anyone!" 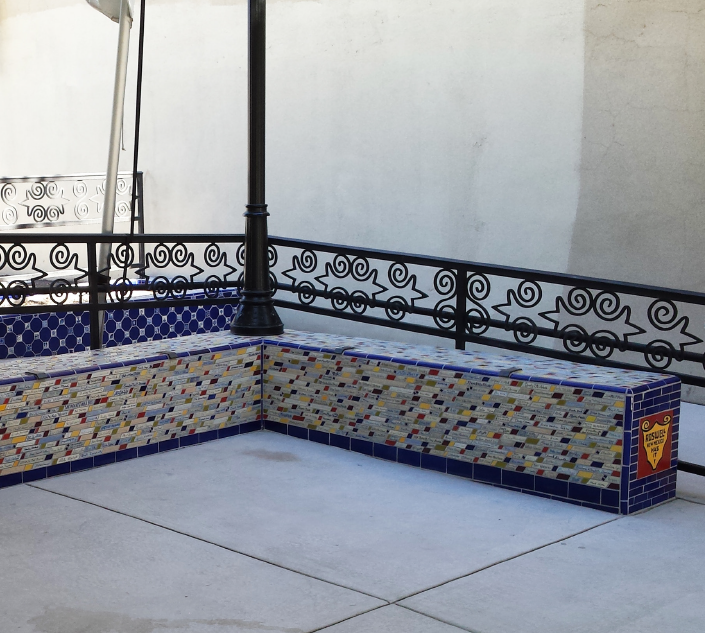 Click here to read the full Project Spotlight. Click here to view/download the LATICRETE Guide to Construction Chemicals Brochure, that provide products for the construction, repair and protection of concrete. Contact us to discuss your next flooring project or to arrange a mock-up by calling 1800 331 012 or email us ﻿here. 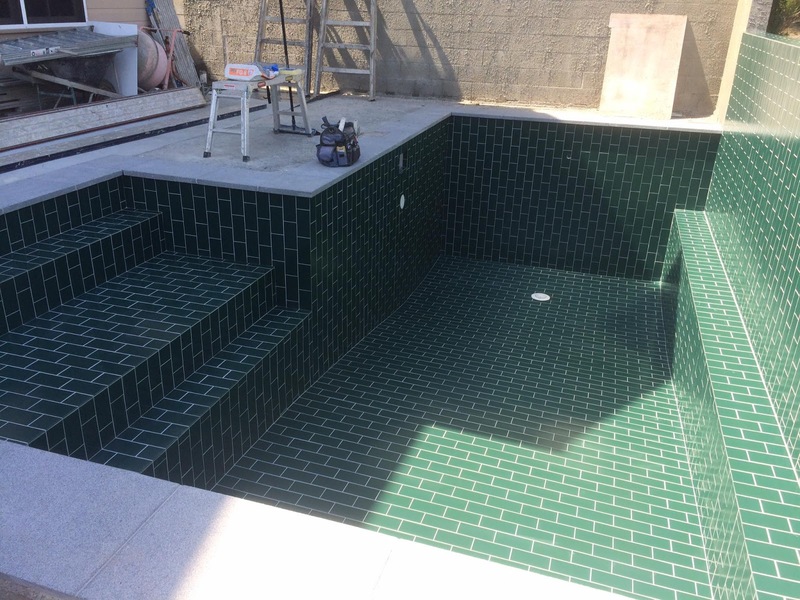 Liam from Perfect Joint Tiling shared with us his timber look tile project currently underway in Western Australia. The project is now complete! 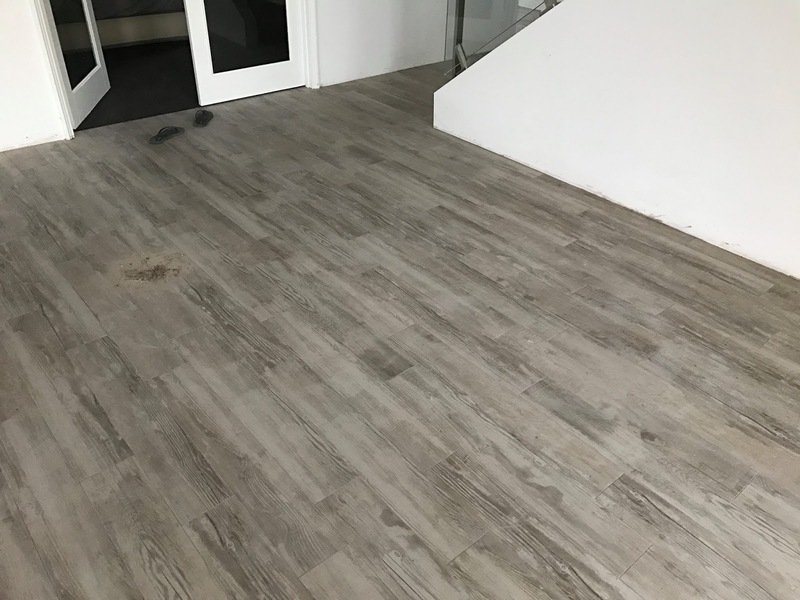 The tiles were laid with 335 Premium Flexible Adhesive and grouted with PERMACOLOR® Grout in 'Hemp', which were purchased from Tilers Express Western Australia. PERMACOLOR® Grout offers the maximum performance available in a cement-based grout, providing consistent colour and antimicrobial protection to resist stain-causing mould and mildew. PERMACOLOR Grout is easy to install – just mix with water. For more information on using LATICRETE, arranging product demos, samples or for technical support - Call 1800 331 012, email sales@laticrete.com.au or visit www.laticrete.com.au. Tuggerah Tiles recently held a LATICRETE Trade BBQ and it seems Aaron Spiteri and the team from BellaVaeh Tiling Solutions were extra keen to get their LATICRETE gear on. Keep your eyes peeled for LATICRETE trade events happening across Australia next year to be certain to get your FREE LATICRETE gear. Contact on 1800 331 012 to arrange FREE samples, a trade event, a demo or for product information. 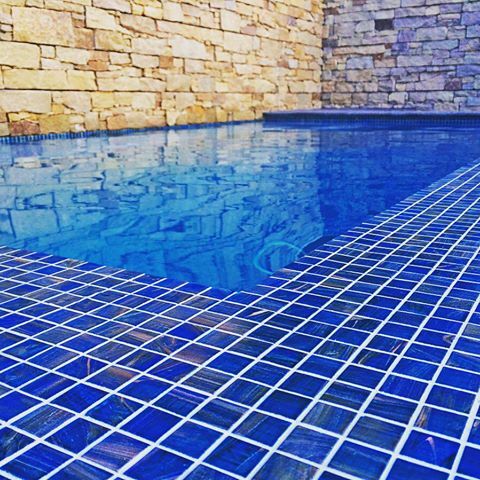 This beautiful plunge pool in Port Stephens was installed by the team at Adept Pools in NSW. 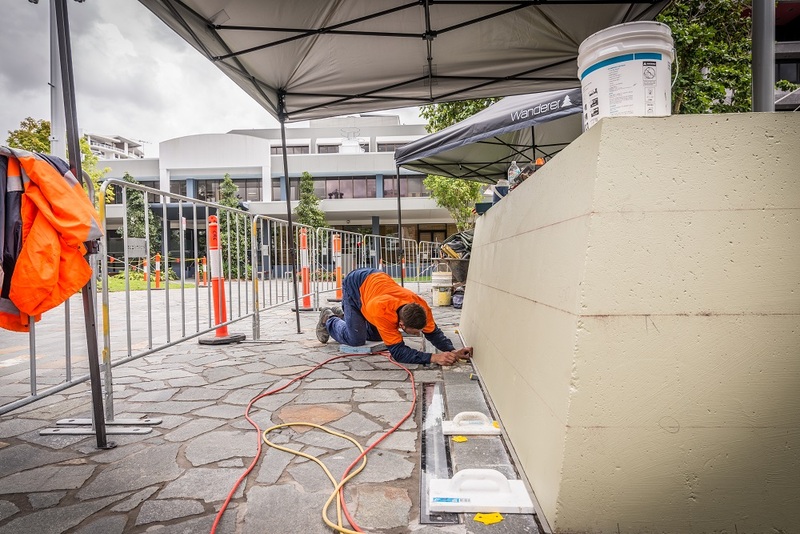 The team chose LATICRETE for the preferred installation materials, using a range of LATICRETE products including SPECTRALOCK PRO® Grout. SPECTRALOCK PRO Grout is a patented, high performance epoxy grout that offers colour uniformity, durability and stain resistance with extraordinary ease of use. SPECTRALOCK PRO Grout is designed for use on ceramic tile, glass tile and stone applications, both residential and commercial. It can be used both interior and exterior on floors and walls. Ideal for re-grouting applications, SPECTRALOCK PRO Grout is perfect for swimming pools, fountains and other wet area applications. Click here for more product information and an installation video. Contact us to discuss your next project, arrange a demo, your FREE samples by calling 1800 331 012 or contact us here. 3701 Mortar Admix is a specially designed latex admixture for use with thin-set adhesives, cement grouts, cement mortar beds and other cement mixes. 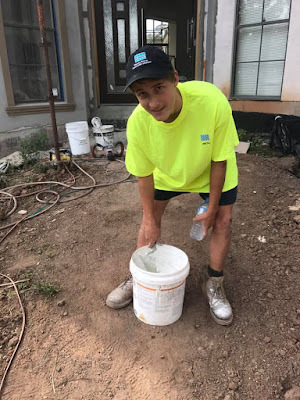 Used in place of water, 3701 Mortar Admix improves the working and physical properties of any cement mix and provides an economical and easy way to make permanent, trouble-free installations of ceramic tile, brick and natural stone. HYDRO BAN® is a thin, load bearing waterproofing/crack isolation membrane that DOES NOT require the use of fabric in the field, coves or corners. HYDRO BAN is a single component, self curing liquid rubber polymer that forms a flexible, seamless waterproofing membrane. 345 Platinum is the ultimate one-step, polymer fortified, thin-set adhesive. 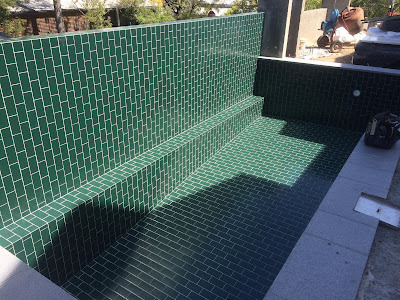 For interior and exterior installation of ceramic and stone tile, reduced thickness porcelain, quarry tile, pavers and thin brick. 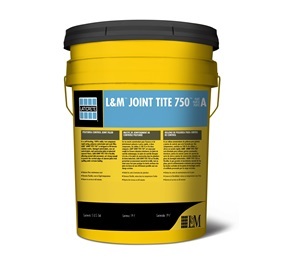 345 Platinum provides long open time with unsurpassed adhesion and workability. Thank you for helping shape our business. It has been quite a year for us all and we hope that 2016 has been just as memorable for you, your colleagues and your loved ones. The team at LATICRETE Australia are taking a break over the festive season. 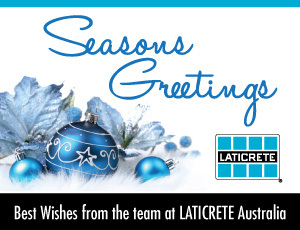 To ensure you are not inconvenienced please click here to view/download the 2016 LATICRETE Australia Holiday Schedule regarding: No Shipping or Receiving, Last Shipping and Business Day for 2016 and when LATICRETE Australia will Re-open for business in 2017. Have questions regarding the LATICRETE Australia 2016 Holiday Schedule? Call 1800 331 012, email: sales@laticrete.com.au or chat with your LATICRETE Sales Rep.
"Ahhh the love for this quality product, ready to go out to our next glass mosaic pool project" ~ Steve Rennie, Exquisite Tiling, Perth, WA. 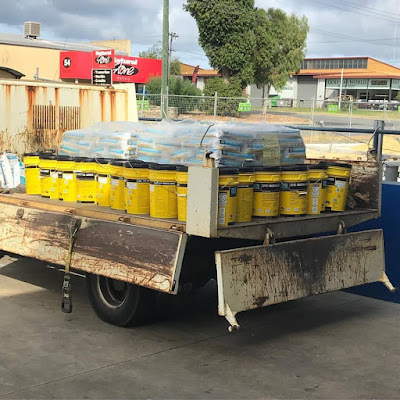 There isn't any doubt which products Steve Rennie from Exquisite Tiling in Perth, W.A prefers to use on his projects. Steve's children are happy with the selection their Dad made with his purchase from the LATICRETE stockist, Tilers Express WA. 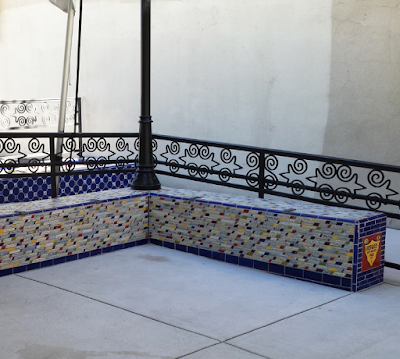 We hope to share this glass mosaic pool project as it progresses. LATICRETE® Underwater Submersion System is composed of time and job proven LATICRETE tile installation products which have been successfully installed around the world for 60 years. It provides single source responsibility for these demanding, high performance applications. The system is resistant to chemicals, shock treatment, pH imbalance of water and has the flexibility and high strength to accommodate differential movement caused by moisture expansion and drying shrinkage. Click here for a LATICRETE Pools, Spas and Fountains System Brochure. Starting a pool project in the near future? Give us a call on 1800 331 012 or contact us here. This basketball court showcases the LATICRETE SPARTACOTE® Blended Chip flooring system. Contact us to discuss your next flooring project - Call 1800 331 012 or email us ﻿here. This stunning vertical brick bond pool in QLD definitely has the wow factor! 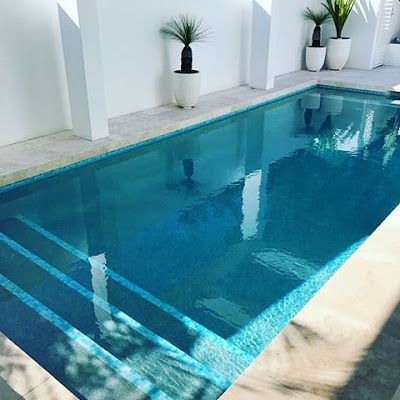 Pool tiler Blair, from Onshore Tiling, along with pool builders Performance Pool & Spa, have installed this incredible looking 75m2 pool. HYDRO BAN® is a thin, load bearing waterproofing/crack isolation membrane that DOES NOT require the use of fabric in the field, coves or corners. HYDRO BAN is a single component, self curing liquid rubber polymer that forms a flexible, seamless waterproofing membrane. HYDRO BAN bonds directly to a wide variety of substrates. It is capable of handling loads, fork lift traffic and is suitable for use in Industrial and manufacturing facilities, warehouse areas and can be used on cold room and freezer storage floors due to its ability to cure and remain flexible in cold conditions. 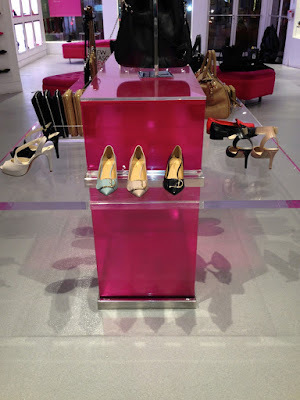 It can be used as a standalone solution or in conjunction with LATICRETE SPARTACOTE® resin flooring systems. Click here for more product information. Contact us for more information by calling 1800 331 012 to discuss your next project or contact us here. Tile, stone and masonry surfaces are under daily assault from regular household stains, however, treated properly, the investment in a natural stone counter top will last a lifetime. 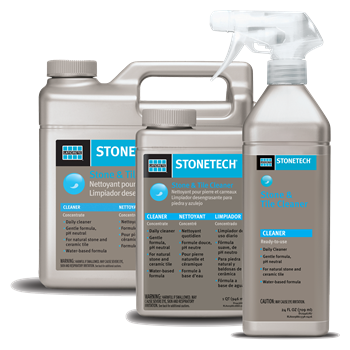 STONETECH® stone, tile and masonry care products are innovative, easy-to-use solutions to protect and preserve stone against the damaging effects of everyday living. With a complete line of products to protect, clean and transform stone surfaces, STONETECH help ensure the beauty of natural stone and tile counter tops, floors, walls and other installations for generations to come. STONETECH Stone & Tile Cleaner is a daily cleaner designed to clean every day messes on natural stone and tile. STONETECH Stone & Tile cleaner is suitable for a range of substrates including marble, granite, limestone, travertine, slate, sandstone, flagstone, concrete, and porcelain tile. Contact Sareen Stone for more information on the STONETECH range, or contact us here. Check out this plunge pool project in Spring Hill, QLD, currently being installed by Sam Gardener from Sam Gardener Tiling. 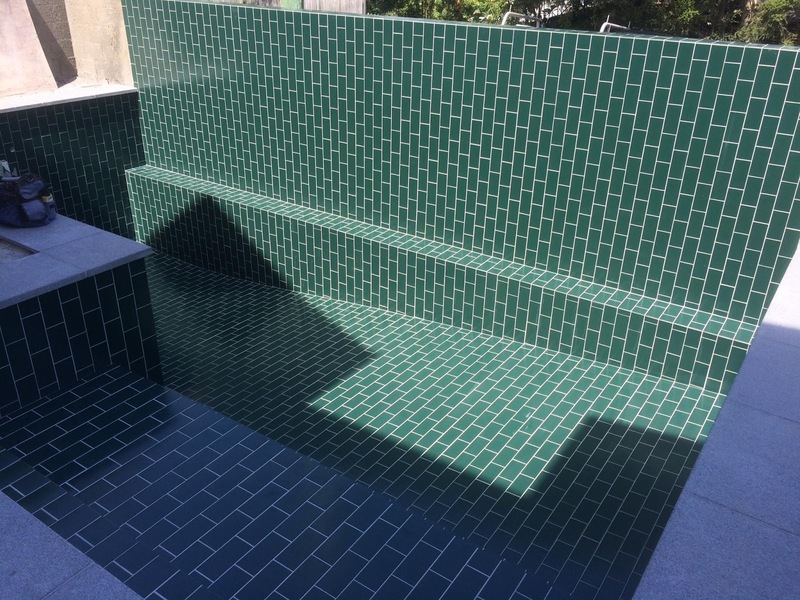 The plunge pool will feature a green mosaic with a diesel effect and will also have 30mm thick marble bench seat and coping. A range of LATICRETE materials are being used for the installation of this project, including 3701 Mortar Admix. Keep your eyes peeled for more pics to come of this plunge pool! 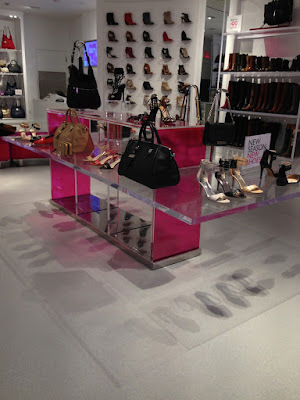 LATICRETE SPARTACOTE® was recently selected as the preferred flooring solution for a Nine West shoe store located in New York City's Rockefeller Centre - one of the most heavily trafficked retail centres in North America. The design and architectural teams were looking for a flooring system that could meet all of the above requirements while providing an aesthetically pleasing finish - the solution: LATICRETE SPARTACOTE Blended Quartz flooring system. 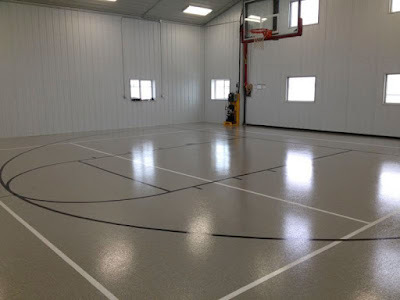 The seamless floor provided a durable and consistent finish that spanned the entire field and enhanced the overall ambiance of the environment. Read the full Project Spotlight here. Contact us to discuss your next flooring project or to arrange a mock-up by calling LATICRETE on 1800 331 012 or email us here. Temperatures are rising in Australia and its only going to get worse this summer. We have provided some helpful hints and tips for tiling and grouting in hot weather to ensure the best installation of your projects over the hotter months. The 10ºC Rule – for every 10ºC above 21ºC, Portland cement and epoxy based materials take half as long to cure. 1. For best results, always ship and store installation materials at 5ºC – 32ºC to extend the shelf life and working time. Do not store products in direct sunlight. If installation materials are too warm, they should be cooled to the specified temperature range for that specific product. 2. Dampen or wet down substrate surfaces to not only clean the area, but to lower the temperature and lower the absorption rate of the substrate. Sweep off excess water just before mortar is applied. This step will extend the working time of the installation materials. 3. Stir latex additives thoroughly before mixing with thin-sets, grouts, plasters, stuccos and other Portland cement mortars. 4. 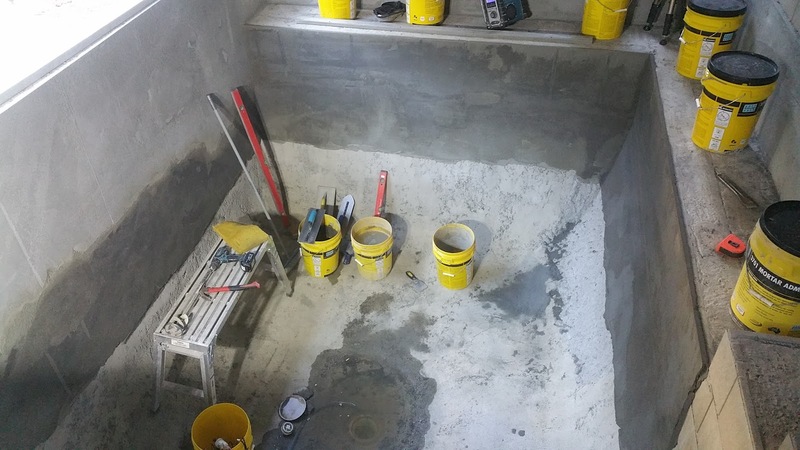 Due to the rapid rate of moisture loss and Portland cement dehydration at temperatures >32ºC, cover installations with polyethylene sheeting for 1-2 days to allow curing at a more normal rate. 5. Low humidity also accelerates the curing process. 6. Tent off or provide shade when working in direct sunlight. 7. Work during cooler periods of the day (e.g. early morning). 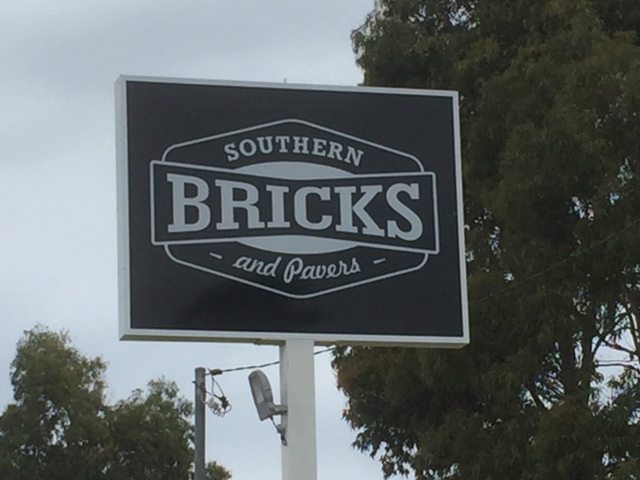 We are excited to extend a warm welcome to Jono and Kirrily from Southern Bricks and Pavers in NSW. Southern Bricks and Pavers have joined the LatiFamily as a preferred stockist of LATICRETE tile and stone installation materials. Drop in to see the friendly team and stock up with all your LATICRETE products! For more information about using LATICRETE in your projects, product demos, samples or technical support please contact LATICRETE on 1800 331 012, email sales@laticrete.com.au or visit www.laticrete.com.au. HYDRO BAN® - A thin, load bearing waterproofing/crack isolation membrane that DOES NOT require the use of fabric in the field, coves or corners. SPECTRALOCK® PRO Grout - a patented, high performance epoxy grout that offers colour uniformity, durability and stain resistance with extraordinary ease of use. 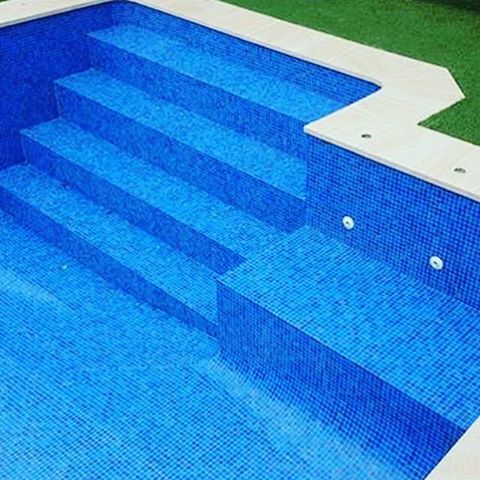 The LATICRETE Pool, Spa and Fountain Tiling System is composed of time and job proven LATICRETE tile installation products which have been successfully installed around the world for over 60 years. It provides single source responsibility for these demanding, high performance applications. The systems is resistant to chemicals, shock treatment, pH imbalance of water and has the flexibility and high strength to addommodate deffierntial movement caused by moisture expansion and drying shrinking. Click here to view/download the Pool, Spa and Fountain Tiling Systems Brochure. Contact us to discuss your next project, arrange a demo or your FREE samples by calling 1800 331 012 or contact us here. Labels: 335 Premium Flexible Adhesive, 3701 Fortified Mortar Bed, Adept Pools, HYDRO BAN®, Pool, SPECTRALOCK PRO Grout.